Hello again, and welcome to another Sketch challenge with the Paper Craft Crew! It is wonderful to see all the amazing cards that are created for our challenges; I just love taking my time visiting everyone’s posts to read about their inspiration in choosing their stamp sets, and colours. It’s interesting what can inspire us – or what we can do when we feel uninspired! – to put together a card. I decided that I wanted to use a set I had recently got, but not had a chance to use yet – it’s called Number of Years, and it’s in the Occasions catalogue. 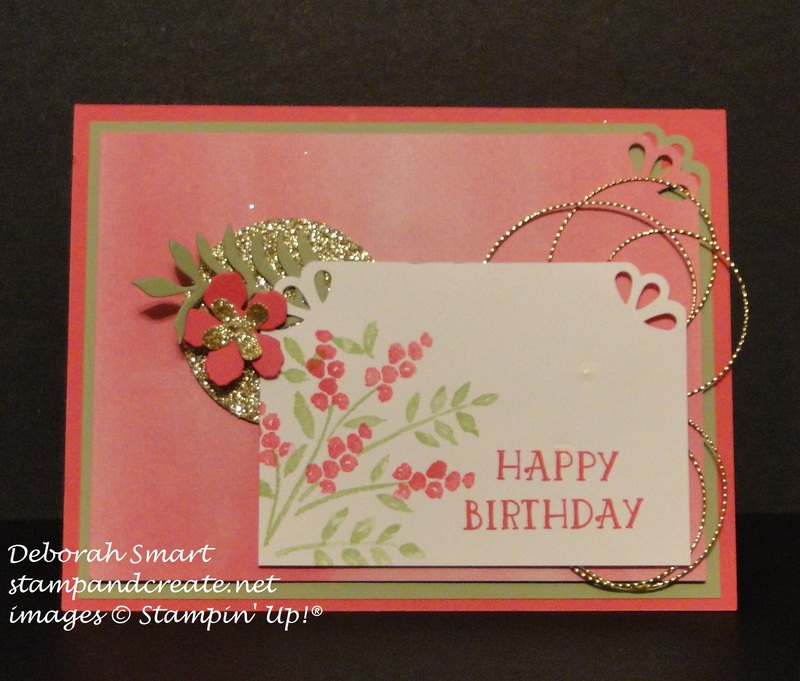 I started by choosing my card base of Melon Mambo cardstock, then added a panel of Pear Pizzazz. On top of that I chose to use a piece of the Perfectly Artistic Designer Series Paper from the Sale-A-Bration brochure (if you’re lucky, there may still be some left to get for Free!). I liked the soft watercolour wash look on this side of the paper. Before attaching them with Dimensionals, I punched the top right corner with the Curvy Corner Trio Punch. To create my stamped panel, I cut a piece of Whisper White cardstock at 3 1/2″ x 2 1/2″, and stamped the leaves in the left bottom corner in Pear Pizzazz ink. I then added the grouping of flowers in Melon Mambo ink, inking up each time I stamped, as I wanted them to be nice and bright. I then lined up the Happy and Birthday stamps together on my clear block, and stamped them in Melon Mambo ink in the bottom right corner. I then used the Curvy Corner Trio Punch to create the scallop in the top 2 corners. I used the Botanical Builders Framelits to die cut the small flower from Melon Mambo cardstock, and the smallest flower from Gold Glimmer Paper, which I placed in the middle of the small flower. I also die cut the fern leaf from Pear Pizzazz cardstock. I used the 1 3/4″ Circle Punch to create the Gold Glimmer circle, and layered it behind the stamped image panel. I attached some loops of the Gold Cording Trim to the back of the right side of the image panel, then attached in all to the card front using Stampin’ Dimensionals. I really enjoyed this sketch – I hope you will, too! 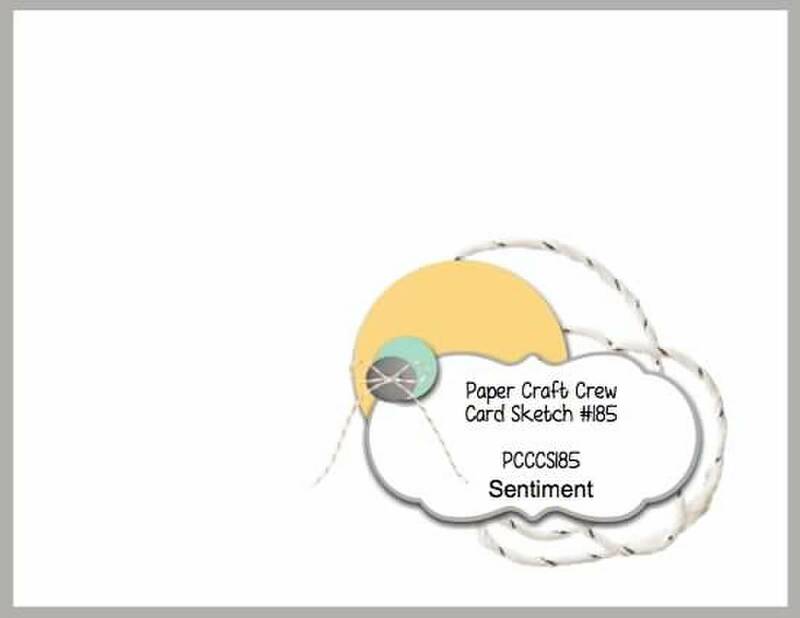 Check out the Paper Craft Crew page to see the other design team member cards, then be sure to link up your own card for the challenge. I’ll be looking for you!